As I walked out of the train station, there it was staring up at me, reminding me of the futility of fighting the future, of punching at shadows, and of using up energy worrying about the not-yet. Someone had taken the time to write it. It certainly was not done hurriedly, for from the formation of the letters you can imagine the care that was employed in its composition. Its message contained no ambiguities; it was all inclusive. We should allow "nothing" to cause us to worry. The message makes sense. We use up so much energy being fearful of and worrying about the future that we neglect to take care of the present. The reality is that that which does not exist cannot harm us. The future, to the extent that it exists, is nothing more than a compilation of our imagination - a creation of our minds, existing in our minds. In other words, that which we fear is of our own imagining. 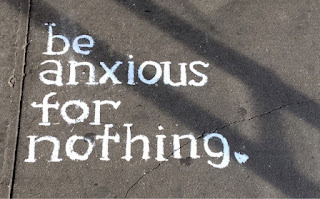 So, be anxious for nothing. What should we do instead? Instead, we should use the energy we would spend on being anxious about that which does not exist to help us deal with the problems of the now, the problems that do exist. When I was about eleven years old I awoke in the wee hours of the morning to a violent shaking of our house, combined with the most horrific, grating sound. We were experiencing an earthquake. I noticed someone sitting on my bed. It was my father. He was the picture of calm and serenity in the upheaval that engulfed us. It was an image that stayed with me the rest of his life and that influenced my own response to crises. He was not worried or anxious. I thought to myself, if my dad was not worried, I will not be worried. In the regulation of my own personal sojourn in this world I subscribe (and unashamedly so) to the belief of a higher power guiding and directing my life. In the goings-on in the world there is much that might occasion cause for worry or anxiety. And since my Person is not worried or anxious, why should I be. Everyday brings its own share of problems or difficulties. Why then should I worry about the future's non-existent difficulties when I have today's to take care of. By taking care of today's difficulties, I am in fact taking care of tomorrow's problems. So, let's heed the message on the sidewalk. Be anxious for nothing.